PhD in Dental Sciences is a full-time 3 years Doctorate course. Many colleges offer PhD Dental Sciences course in India. Every college has their own eligibility criteria, admission process, and fees structure. The average fee for this course ranges between INR 10,000 to INR 15 lakhs based on the candidate’s marks obtained in their master’s degree or entrance exams. In this course, students various forms of treatments including Dental materials, Surgical procedures, Oral histology, Pedodontics, Radiology, Dental anatomy, Oral Pathology, Oral medicine, Community dentistry, etc. Students also study function, structure, and path function of stomatognathic and craniocervical region. The curriculum includes Oral pathology, Orofacial pain, advanced radiology, Advanced Oral medicine, and Drug interactions in Dentistry. Candidates who have completed Master’s degree in Dental Sciences or an equivalent degree from a recognized university are eligible for PhD in Dental Sciences course. Candidates who have 50% of marks or 6 GPA point scale in Master’s degree or an equivalent degree are also eligible. The percentage may vary from one college to another. Eligible candidates may apply for this course through online/offline. Admission for PhD in Dental Sciences is based on merit list or entrance-based. Most of the colleges select students based on the marks obtained in their master’s degree or an equivalent degree. Some reputed colleges conduct entrance exams for this course admission. Students who are selected for entrance exam should attend the personal interview conducted by the college. Based on their performances, they will be selected for admissions. After completion of this course, graduates may work in fields like Dental Clinics, Hospitals, Health Centers, Research Institutes, Dental Colleges, Pharmaceutical Industries, etc. These professionals may work in positions like Dentist, Ceramist, Oral Pathologist, Professor, Medical Consultant, etc. The average salary for these professionals ranges between INR 2 to INR 20 lakhs as per their experience and expertise in this field. PhD in Dental Sciences: What is it about? PhD in Dental Sciences course emphasizes molecular, biochemical, and cellular aspects of pathological conditions which are localized to craniofacial components effecting or within the oral cavity to influence system health. In this course, students also learn how to develop a comprehensive treatment for patients. Students study input on treatments with perspectives from pediatric dentistry, endodontics, periodontology, orthodontics, oral surgery, and prosthodontics. The main purpose of this course is to provide relevant information for practising dentistry and to prepare graduates for the changes in dentistry and to gain higher level knowledge in oral surgery. This course provides a framework to the biological concepts of therapies and emerging therapies in the treatment of oral diseases. Students study subjects include radiologic management of patients with complex diagnostic problems. Candidates who have completed Master’s degree in Dental Sciences or an equivalent degree from a recognized university are eligible for PhD in Dental Sciences course. Candidates who have 50% of marks or 6 GPA point scale in Master’s degree or an equivalent degree are also eligible. The percentage may vary from one college to another. Eligible candidates may apply for this course through online or offline. A year-wise syllabus for PhD in Dental Sciences is given below. The syllabus may vary from one college to other. PhD in Dental Sciences: Who should opt for this course? Candidates who have interest in Dental Sciences and its related applications are suitable for this course. Dental Sciences is one of the recognized professional careers and it is among the top career choices made by professionals in India. 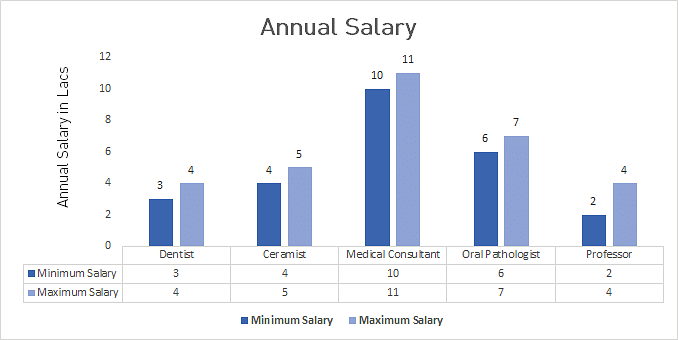 Dental Sciences professionals are very demanding and remunerative. Graduates can start their career as practitioners in community hospitals, nursing homes and in industries. The majority of the job opportunities for a graduate in this field are available in a universities, research institute, and teaching hospitals. Professionals in Dental Sciences field may get opportunities in areas like Dental clinics, Dental equipment manufacturers, Dental product manufacturers, Hospitals, Research Institutes, Pharmaceutical companies, etc. Some professionals may work in top dental colleges and institutes as a lecturer and professor. Skilled professionals may get jobs in both government dental hospitals and private dental hospitals. Few graduates may start their own dental clinics and hospitals. Graduates may work in roles offered by the top dental hospitals and industries include Dentist, Dental surgeon, Consultant, Dental hygienist, Dental assistant, Public health specialist, Oral pathologist, Dental surgeon, Private practitioner, Ceramist, Dental lab technician, Sales representative, Medical representative, Professor, Medical consultant, Pharmacist, Associate Consultant, Customer Relationship Manager, etc. Private practitioners can set up their own dental clinic which could help them to gain the confidence and revenue.